It’s all about luxury in men’s perfumery at the moment. With the rise of niche perfumery, mainstream brands have had to up their game in terms of creating more intriguing, artistic and high-quality fragrances to encourage consumers to stay loyal. This has had an impact on packaging too, which seems less kitsch and more polished. Simple, classy and bold, that’s the modern signature and it’s filtered its way down to one of the most popular mainstream brands: Paco Rabanne. Paco Rabanne is a brand known for having fun with its scent, packaging them in novel (and really cool) bottles, whilst the scents themselves boast bold signatures. But their latest launch Pure XS has a touch of ‘niche’ about it, evoking true classics with its heavy cigarette lighter style bottle and elegant juice. This is a fragrance for the luxurious man – the gent that likes a touch of class wherever he goes and with Pure XS he’s going to smell pretty darn good. Pure XS starts out deceptively sharp and tangy with a bright, lemony citrus note that feels buoyant and bubbly. I say this is deceptive because Pure XS warms up considerably with time – but more of that later. As the lightness of the lemon wears off, the harmony of greenery and herbs send forth a dryness that is accented by the richness of spice. There’s a fun kick underneath thanks to the clash of ginger and cardamom, both of which add a little bit of buzz to an otherwise sedate composition. In the base, Pure XS embodies the texture of the box it comes in, which is a supple dark velvet. The sweetness of vanilla is tempered by the warmth of myrrh, whilst a mineral note of incense adds a silvery touch. There’s an air of complexity in the dry down that leads one to think of rich textures like suede, and that puts Pure XS in line with suave contemporaries such as Dior Homme and Valentino Uomo. Not bad company, eh? 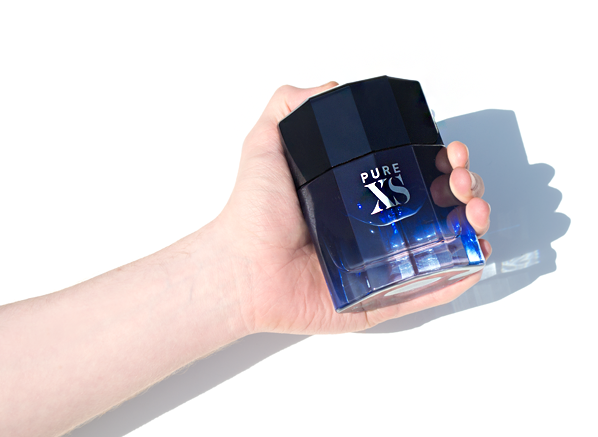 Pure XS feels like a very modern, typical masculine fragrance with a luxurious twist. This means that it has mass appeal but subtly hints that there is a level of refinement, so that men can opt in for wearing something a little bit more refined, whilst not going for something completely out there. It’s the type of scent that sticks within a guy’s comfort zone but elevates his scent choice to something much trendier. This entry was posted on Wednesday, August 2nd, 2017 at 9:30 am and is filed under Candy Perfume Boy, Fragrance, New products, Tried & Tested. You can follow any responses to this entry through the RSS 2.0 feed. You can skip to the end and leave a response. Pinging is currently not allowed. I’m a big fan of this from Paco Rabanne! Different to my usual one million prive!